Before you even ask, no. I have never seen a Rin Tin Tin movie. I have never seen a Rin Tin Tin show. I didn’t even know what the original Rin Tin Tin looked like until I read this book (or how different German Shepherds used to look in comparison to how they look now). However, these facts speak to the illustrious ubiquity of this dog in such a way that I felt compelled to borrow Susan Orlean’s Rin Tin Tin: The Life and Legend from the library when I saw it. 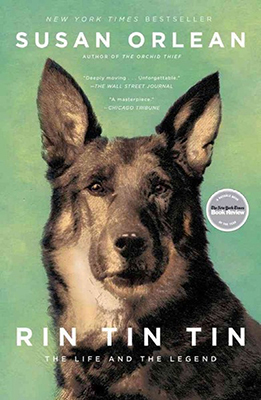 I don’t know about in other countries, but here in the United States, the name Rin Tin Tin is so entrenched in the American pop culture lexicon that I’m absolutely certain that there are myriad others, just like me, who have never once seen any Rin Tin Tin movie or show, and yet know precisely who Rinty is. For those who might not know, Rin Tin Tin is a German Shepherd (or Alsatian, as I believe the breed is called in some other countries) of epic entertainment proportions. I use “is” rather than the past tense, even though the original Rinty has been dead for many years, because just like other famous dogs—Lassie, Benji, Toto, Snoopy, Scooby—the dog might die but the name lives on (okay, Snoopy and Scooby can’t die). In Rin Tin Tin’s case, however, the name isn’t merely a stage name given to another dog. Lassie was never Lassie. Lassie was Pal. Benji was Higgins. Toto was Terry. But Rin Tin Tin…was Rin Tin Tin. The life and legend both began during World War I, in a field in Flirey, France, where American soldier Lee Duncan found two German Shepherd pups still alive among the wreckage of a battle-damaged kennel. Duncan, a quiet, shy young man who found solace from an emotionally turbulent childhood in animals, claimed to instantly see something special in little Rinty and fought to bring him home once he was discharged from service. Back home in California, Duncan trained the dog and took him to Hollywood, where they literally walked from studio to studio, looking for someone who would be interested in making movies that would star Rin Tin Tin. Talk about a fairy tale story. Rin Tin Tin starred in several silent films and appeared in talkies as well as television shows (and radio, too! Radio! For a dog!). Of course, the name has fallen to several different dogs (the original dog lived from 1918 to 1932, which means that the name of Rin Tin Tin has outlived its original designee by 82 years…and has existed for this line of pooches for almost 100 years). In fact, Rin Tin Tin XII still makes appearances at public events, although the ownership of the dog and the name has become quite muddled throughout the years. And that’s where Orlean’s book becomes quite an interesting tale. Honestly, the entirety of the story is fascinating. Orlean weaves a tapestry not just of the lives of the dog and owner and those they brought into their fairy tale, but also of the times and the events that shaped and were shaped by Rinty throughout the years. History, sociology lesson, Hollywood fabrication, love story, legal dissent, and urban legend, all rolled into this impressive tale of one of the most long-lived and beloved canine legends to emerge from the mists of bygone Hollywood. Final Verdict: I love dogs, so of course I loved this book. I’m willing to bet that if you actually watched Rin Tin Tin, either his movies or his shows, then you would love this book even more than I did. Even if you know nothing about Rinty, this is a beautifully crafted biography of a dog and a time long passed but still cherished. I’ve already added this one to my wish list.